I hope you’re not tired of reading these newsletters so far. If not, I applaud your patience with me in the past few months. But next week, as Firefox 57 will merge to the Beta channel, I’m planning to write the last one of this series. Nightly has been pretty solid on performance. It is prudent at this point to focus our attention more on other aspects of quality for the 57 release, to make sure that things like the crash rate and regressions are under control. 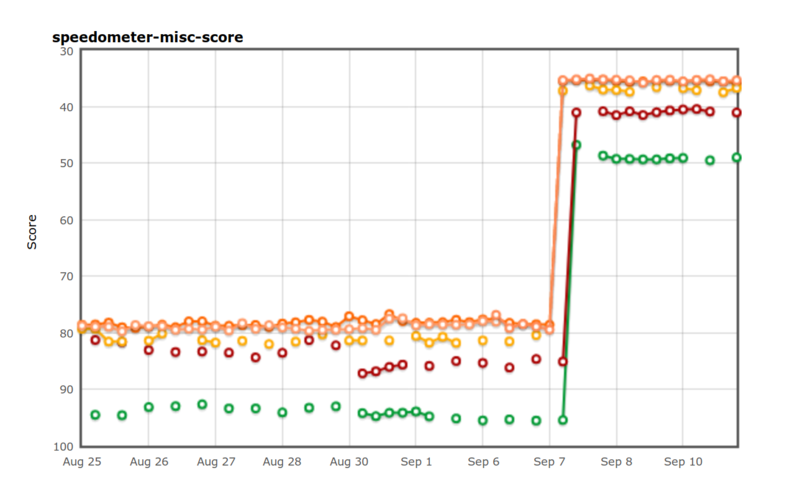 The triage process that we set up in March to enable everyone to take part in finding and nominating performance problems which they think should be fixed in Firefox 57 was started with the goal of creating a large pool of prioritized bugs that we believed would vastly impact the real world performance of Firefox for the majority of our users. I think this process worked quite well overall, but it has mostly served its purpose, and participating in the triage takes a lot of time (we sometimes had two meetings per week to be able to deal with the incoming volume of bugs!) With one week left, it seemed like a good decision to stop the triage meetings now. We also had a weekly 30-minute standup meeting where people talked about what they had done on Quantum Flow during the past week (and you read about many of those in the newsletters! ), and for similar reasons that meeting also will be wound down. This gives back several person-hours back on their calendars to people who really need it, hurray! Marco Bonardo improved the performance of the bookmarks toolbar when it has a large number of bookmarks by only dealing with the few bookmarks that would be visible on the toolbar in the code. Will Wang moved the Windows jump lists updater code to the idle queue. He also moved the sessionstore data collector code in the content process to the idle queue. André Bargull made IsRegExpObject and RegExpInstanceOptimizable inlined in the JIT code. He also removed some unnecessary rooting in intrinsic_IsConstructor. Kirk Steuber made it so that we try to call ::RegisterDragDrop during idle time which makes it more likely that a DLL will be preloaded off of the main thread, which should improve start-up performance in some cases. Robert Strong made it so that we avoid main thread IO after first run after an update is applied, and when an update is downloaded. This should help improve performance for our Nightly users in particular, since they get updates very often. Andrew McCreight landed the code that allows all JSM’s to share the same compartment. There are general performance and memory benefits to doing this. This is landing disabled by default, and the bug to enable it is here. Kris Maglione sped up some of the MessageChannel.jsm code involved in the webRequest API, among other things. He also ensured that the JSM script precompiler compiles scripts into the shared JSM global mentioned above to save the cost of cloning them into the destination global before execution. Kris also removed the add-on SDK from Firefox. The code inside the add-on SDK was used by some legacy extensions and various internal browser components and was the source of many performance issues, and removing it was the last measure to make sure that such issues would never rise again in the future. Botond Ballo enabled asynchronous scrolling when the scrollbar thumb is dragged using touch input. Mason Chang and Bas Schouten enabled specifying a limit on the blend surface area and the portion of the layer being resolved for D2D draw targets. Andrea Marchesini avoided doing main-thread I/O when reading the contents of files read under some situations for some Web APIs that access files. One example is a file selected using an input element which is read using a FileReader. Mats Palmgren optimized away a lot of the virtual calls to QueryFrame through do_QueryFrame(). Emilio Cobos Álvarez avoided flushing frames in nsHideViewer when we know a new frame won’t be constructed. This sped up loading new results on Twitter under some circumstances dramatically. So there will be no triage meetings and newsletters for Quantum Flow anymore, but it will continue as a project? How will you make sure performance remains a top priority or even get better beyond Firefox 57? Thank you for your hard work so far, the progress was amazing. We have been thinking hard about this. I’ll write about what we’re thinking of doing about this post Firefox 57 next week! The work you’ve accomplished is very impressive and reminds me of how effective memshrink was. It seems like there is real value to cross-functional “strike teams” and I hope Mozilla continues employing them. It is big pitty, that there is coming end of these newsletters. It makes me a little bit sad, because I was always looking forward to it for a whole week. Anyway great job with new level of performance of Firefox. Many thanks to all, who contributed to it. We will really appreciate even one newsletter per month since as far as I can see there are more than 100+ bugs marked as qf:p2, some of them downgraded from p1, so I believe there is still a lot to improve.